Created by designer Shlomit Ofir, this elegant filigree butterfly pin will add a cool touch of color and a bit of style to your outfit. Israeli jewelry designer Shlomit Ofir is fascinated with nature, and nature-related motifs often show up in her fine handcrafted jewelry. 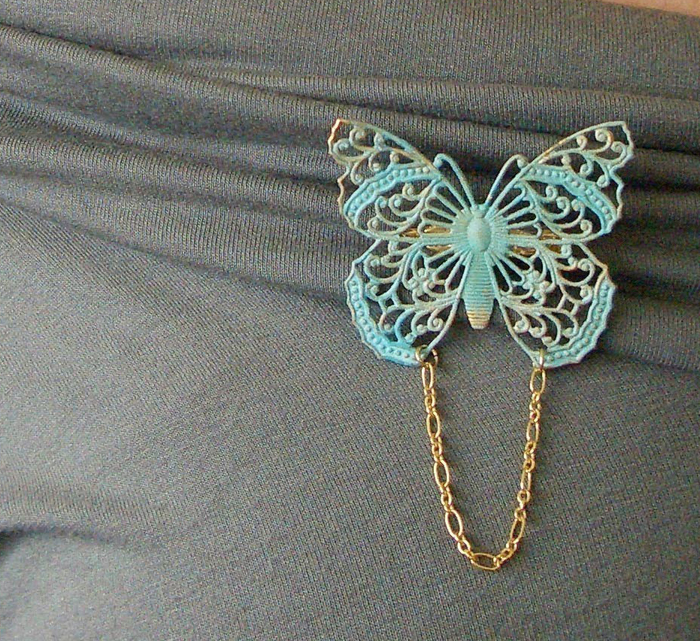 This butterfly brooch is a wonderful example of her nature jewelry. A small butterfly measuring 1 3/4 inch X 1 1/2 inch (4.5 cmX 4 cm) is crafted out of filigree and overlaid with a blue-green verdigris finish. 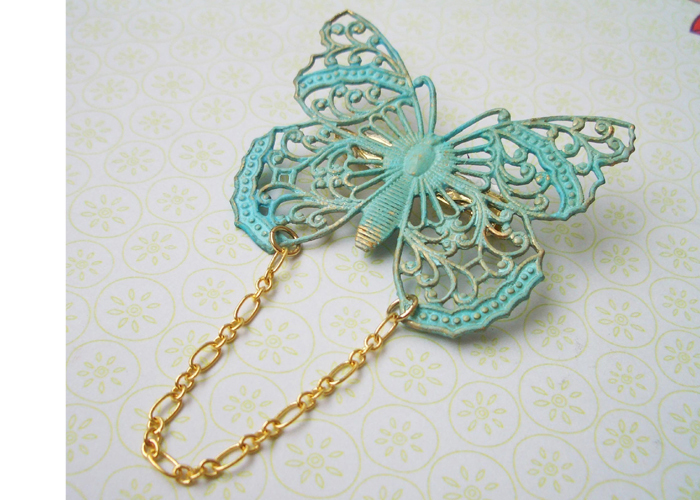 The filigree work in this butterfly pin gives the piece an old-fashioned quality, set off by a short length of gold plated chain that hangs below the butterfly. The warm tone of the gold chain sets off the cool color of the finish and adds an unexpected element. Lovers of nature jewelry, especially fans of butterfly jewelry, will appreciate this truly unique handmade brooch. Shlomit Ofir's jewelry designs are both timeless and contemporary and can be worn by all ages with almost any outfit. Her handmade jewelry makes a wonderful gift for anyone who looks for unusual design and materials and for fans of modern Israeli jewelry design.